The blockchain and cryptocurrency sectors continue to be sporadic at the halfway mark in 2018, but they continue to prove to be exciting markets nonetheless. Here’s what industry experts had to say about Q2 2018 and what to expect for the rest of the year. Much like the first quarter of the year, Q2 2018 posed some challenges in the blockchain and cryptocurrency spaces. That being said, the growth the overarching industry has seen is second-to-none and is indicative that it is here to stay for the long run. In terms of the cryptocurrencies, bitcoin dipped to a 2018 low towards the end of the quarter, dropping to a staggering US$5,826.41 on June 24. In a previous interview with the Investing News Network (INN), David Drake–founder and chairman of LDJ Capital–said that with the rise in over-the-counter trading desks it’s not surprising that bitcoin has been down in 2018. “[Over-the-counter desks] can easily manipulate the [bitcoin] price and push it down,” Drake told INN and explained that there are now over 100 OTC desks when there used to be only six major desks. Bitcoin ended the quarter at roughly US$6,376.62 on June 30, an overall 7.9 percent decrease from US$6,924.49 at the end of Q1 on March 31, 2018. Looking at the blockchain market, big tech companies making investments in the space was a key highlight during the quarter, further solidifying the significance blockchain will have in our every day lives. As such, with Q2 officially over and Q3 2018 well under way, here INN is taking a look back at some of the biggest trends that happened during the quarter, and what investors can expect for the rest of the year. As noted above, cryptocurrencies struggled throughout much of the quarter, with bitcoin itself having its worst Q2 to date dipping below the US $6,000 threshold “as the whole crypto market took a beating,” Abdul Wahid, principal analyst at BIS Research told INN. Similarly, Reality Shares CEO Eric Ervin said that while there was a lot of volatility during the quarter on the cryptocurrency side, it appears to be stabilizing so far in Q3. Meanwhile the overall market cap for cryptocurrencies also took a massive hit during the quarter despite an initial increase in the early goings. According to data from Coinmarketcap.com, the overall market cap for cryptos reached a quarterly high just over US$470 billion on May 5, but by June 30 that number had dropped off significantly to US$255 billion. Cryptocurrency EOS made headlines towards the end of the quarter when it officially entered the cryptocurrency market with its smashing US$4 billion initial coin offering (ICO) on June 1–without even having a working product, which Mondrus said is something that certainly stood out to him. According to CNBC, EOS’ ICO, which was done by a company called Block.one, surpassed even the largest initial public offerings in 2018, but noted that the product still wasn’t live at the time. The project spent a year fundraising to develop open source software, and launched on June 10. “[There will[ probably [be] a lot of good things that come out of EOS,” Ervin added. A number of tech mammoths made their intentions clear in the blockchain sector with top names making investments in the blockchain industry. Ervin told INN that the reason for all the logistics and supply chain power is because of JD.com’s blockchain initiatives. JD.com, which is an e-commerce company based in China, launched its accelerator, AI Catapult, to develop artificial intelligence and blockchain technologies in February. 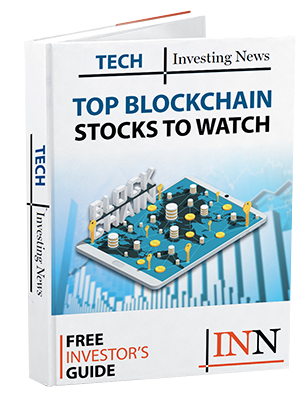 “[It’s] notable when you see a company like Google investing in a publicly traded company because this publicly traded company has such a valuable supply chain management system that has built up blockchain,” Ervin said. Other tech giants like IBM (NYSE:IBM) also made headlines, albeit shortly after Q2, when it received an AUD$1 billion contract to develop a blockchain solution for the Australian government. According to Wahid, blockchain is “poised to wave through essentially every major industry” while having a significant impact on “nearly every corporation” over the coming years. “Blockchain is likely to show greater levels of integration and implementation across all industry verticals, including healthcare, energy, financial, gaming and security,” Wahid said. Wahid explained that regulatory experimentation with blockchain will “even in the presence of high administrative scrutiny across the world,” with banks and financial services continue to heavily invest in projects and start-ups that are working on blockchain-based solutions. Blockchain in the cybersecurity industry “will be the next big thing in [the] security industry” thanks to a rise in security breaches like Equifax, signifying that these corporations “cannot protect current identity data systems” and require a more protected blockchain-based identity approach. Overall, Wahid said that moving ahead into the rest of the year, the blockchain industry will see the development of regulatory framework circling blockchain-based solutions and its infrastructure begin to unfold. In terms of industries adapting blockchain, Wahid said that banking, finance, and security are areas that are “early adopters” of the technology and will benefit significantly from blockchain in the future. “Blockchain technologies are really in its initial stage and only just getting started,” Wahid explained. When taking cryptocurrencies into consideration, making predictions on their pricing is somewhat difficult given the volatile year it’s had to date. “The market is just so weird at the moment,” Mondrus said, stating that when it comes to making predictions, he’ll “just have to wait” before doing so. With bitcoin stabilizing above US$6,000 as of the time of this writing, Ervin said it’s possible that it will start trending higher towards year-end.